Genuine British Army Surplus Super Grade - issued but in nearly new condition. MTP.. 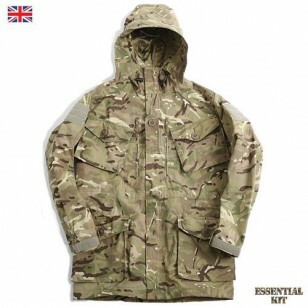 PLEASE NOTE - THE 180/104 SIZE SMOCK HAS HAD THE WIRE REMOVED FROM THE HOOD - but is in otherwise very good condition. Grade 1 - issued but in very good condition. CS95 - Combat Soldier 95 issue. Zip fronted with a 2-way heavy duty zip and velcro storm flap. 2 large angled chest pockets with button fastening. 2 large waist pockets with button fastening. 2 large vertical chest map pockets with zip fastening with inner pen pockets. Velcro panels on each arm for attaching TRFs (Tactical Recognition Flashes). Chest tab for rank slide. Waist and hem draw cords. Part mesh lining to aid ventilation. The CS95 Windproof Smock is a generous fit to allow it to be worn over other clothing layers in cooler climates. Badges may still be sewn on clothing.